A day care is not just a venue where toddlers and infants run and play around for a couple of hours. It is a place where children continue to learn basic communication skills as well as to begin to develop critical thinking skills. Similar to a college or university, the best day care centers are the ones that allow the child to grow mentally. You may also see company email signature examples. If you work in a day care center, you definitely need an email signature to communicate not only with colleagues but also with parents of the children enrolled in the day care center. We have provided some email signature examples you can use if you will be creating your own day care email signature. Listed below are some tips in creating a day care email signature. Take note that a day care email signature is different to other types of email signature, as a day care business is more casual compared to private corporations and government institutions. Day care businesses always revolve around children, so make sure to avoid using dark colors such as black, red, and blue and go for lighter colors instead such as yellow, and lighter variations of red, blue, and green. Bright colors add to the aesthetics of the simple email signature, but make sure to avoid choosing very bright colors as they make the text unreadable. 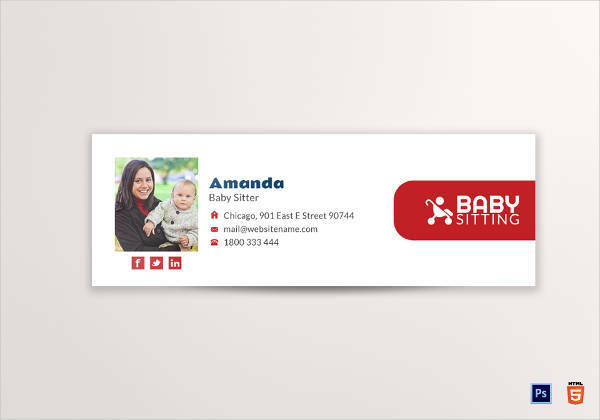 What is the best design to incorporate in an day care email signature? Then look no further than using cartoon-inspired designs. Similar to using bright colors, cartoon designs also add to the child-centric theme of the email signature. There are numerous cartoon characters and concepts you can implement the professional email signature, but it is highly suggested that you go for the popular ones such as Mickey Mouse, Minnie Mouse, Bugs Bunny, Tweety, Daffy Duck, Spongebob Squarepants, Winnie the Pooh, Snoopy, Scooby Doo, Tom, Jerry, and Pikachu, just to name a few. Unfortunately, the email signature does not revolve around the designs you are going to use. The email signature is still a business tool, so a level of professionalism still needs to be observed when creating an email signature. Personal details entail to to your name, position or designation in the company, and contact number. Don’t forget the make the text readable not only for you but for the individuals who you will be having an email transaction with. Before you even decide to open a business that provides child care services, your first need to research if the community really needs a day care center. There are several ways you can do to create a general assessment, but the best method is to talk directly to parents to determine the needs of children living in the said community. The next step is to determine the potential competitors of your day care business. If there are a number of businesses offering a certain type of child care with the area or community, it would be best for your business to create a competitive advantage so that you can differentiate yourself from existing competitors. You may also see personal email signature examples. 3. Home-based or center-based day care business? While there are numerous services offered by day care businesses, there are only two forms of child-care businesses: a home-based business that is run basically at a house or residential premises, or a business that is run at an independent location. No matter what type of child-care business you will operate, you still need to determine the necessary budget and legal requirements to be complied. You may also like corporate email signature examples. Speaking of budget, one of the most important things when starting a business is to prepare a budget. Having a budget will help you plan better for the long-term sustainability of your child care business, while also ensuring you have enough working capital to run your business on a daily basis. When creating a budget, you should also consider start-up expenses, annual expenses, and monthly operating expenses. You may also check out business email signature examples. Choosing a name for your day care business may not require too much time, but it is one of the more important steps in starting a business. The business name easily represents your business to customers and to various market segments. Your business name should be catchy, easy to remember, and should indicate the type of service you are providing. If you plan to operate your day care business near the vicinity or even at your home, then there is no need to find a location. If you plan to open a separate facility, however, you still need to find a good location that can fit your budget. Also consider if you plan to buy the location for long-term use. You might be interested in sales email signature designs & examples. If you want your business to be legitimate, you need to apply for various licenses. These licenses not only include business permits but also licenses to care for children. Your local municipal government office should be able to tell you what licenses you will need to obtain in order to run a day care business. You may also see content writer email signature designs & examples. The state’s licensing office should also provide you with the necessary licensing requirements, which you should strictly comply so that you will be able to operate your day care business. We hope you found this article to be informative as well as helpful when you will be creating your own day care email signature. We also provided some examples that are free to download. 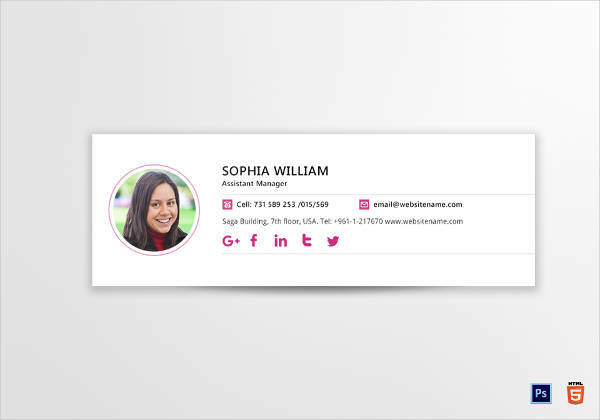 The examples are also easy to edit and customize to help you in creating our own email signature design.